Once people have been to the the casinos they think they have seen all that Las Vegas has to offer. That’s a shame, because Las Vegas offers a so much more without ever seeing a slot machine! Keep reading – we’ve put together some great Las Vegas tips for every kind of traveler. Why not give the kids a running, climbing, laughing kind of vacation experience this year? Las Vegas features great destinations offering just that kind of fun! Just a short drive west of the city, you will find Red Rock Canyon National Conservation Area. The Red Rock Canyon NCA is filled with spectacular scenery and rock climbing, mountain biking and trail riding opportunities. If your kids prefer high-tech fun, you should visit Sega’s GameWorks, right next to the MGM Grand on the Strip. Its acres of games and attractions will thrill the most demanding junior adventurers! For a memorable, and educational, experience, head to The Mirage’s Secret Garden and Dolphin Habitat. Within the Secret Garden lives an amazing collection of big cats, thanks to the efforts of Siegfried & Roy. Walk through the gardens to see rare black and white tigers, snow leopards and white lions. Right next door, your kids can take part in the Dolphin Habitat’s Trainer for a Day program, climbing into a wet suit and right into the water with the dolphins! There’s no shortage of family adventures in Las Vegas. Whether you’re climbing the Red Rocks or riding the Sling Shot at Circus Circus’ AdventureDome, your family’s going to clamor to come back next year. The Gallery of Fine Art at the Bellagio draws visitors from around the world to its remarkable exhibitions. It is an unexpected treasure in the heart of the Las Vegas Strip. Just a short drive from the Strip, you’ll also find a wide variety of artistic styles displayed at Art Encounters, a popular Vegas gallery. For ballet lovers, the Nevada Ballet Theatre offers world-class performances with a distinctly Vegas flavor. One more must-do experience for dance aficionados – the Las Vegas Contemporary Dance Theatre performs at beautiful Spring Mountain Ranch in Red Rock Canyon to rave reviews. Still haven’t seen just what you want for your next Las Vegas trip? Why not plan to tour the unusual and historical side of Vegas? You’ll find fantastic displays of high performance vehicles at the Carroll Shelby Museum on Speedway Drive. For something to really rock your world, experience the power of a simulated atomic blast at the Atomic Testing Museum‘s Ground Zero Theater. To round off your trip, interact with famous figures at Madame Tussaud’s Wax Museum. Where else can you get your picture taken with Elvis and George Clooney on the same day? And don’t forget to stop by Ethel M’s famous Chocolate Factory and Botanical Cactus Gardens in nearby Henderson. No matter what your taste, there’s something to savor in Las Vegas. Gamble to your heart’s content, but don’t miss the chance to really get to know the treasures Sin City has to offer. 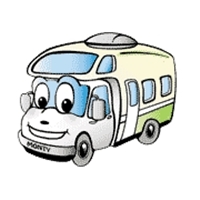 And if you need an RV Rental for your Las Vegas RV vacation, check out El Monte RV’s Las Vegas RV Rentals Location.